Did you know that when eating out at a restaurant… alot of times you can order good choices that might not be on the menu? 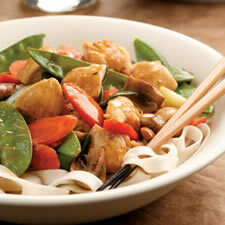 Usually most places will have some type of chicken or fish dish with a carb & vegetables. Say you see a dish with chicken and pasta with some type of sauce. Or you see a fish dish, but it’s breaded and/or fried and the side is a baked potato with cheese and broccoli. Or you see a chicken dish with vegetables and they’ve been cooked in oil. And, what if those are your best choices off the whole menu. Which one do you eat? Which one is the healthiet? This is what I do when I see choices like that. Usually places that have choices like that… can also make the same combinations, but can prepare them a little healthier if you ask. So what do you ask for? You always want to try to get your chicken or fish grilled or steamed, with no breading. You can also get baked if it’s not baked in butter or any fatty sauce. Try to stay away from sauces if you can or get it on the side if you want, so you at least you have control over how much you eat. For the baked potato you would want to get it plain with no cheese, sour cream, or butter. You can still have the broccoli on it, but ask if the broccoli can be steamed. Anytime that there are choices of pasta, potato, fish, chicken or vegetables… you can always ask for everything plain with no sauce or butter and ask if they can steam or grill things rather than fry. You’ll be surprised how often they can accommodate you if you just ask. Then you don’t have to be afraid of going out to dinner anymore! This entry was posted in Articles, Getting Leaner, Nutrition and tagged best choices in restaurants, eating healthy when you go out, fat loss, healthy eating, lose weight, Nutrition, Reno Fitness Trainer, reno personal trainer Clifta Coulter Perez, RenoFitnessTrainer.com, restaurant eating, Weight Loss. Bookmark the permalink.